Lurking Rhythmically: I Like Guns - Ponies. Pistols. Prepping. Photo by the inimitable Oleg Volk. Some days I feel like I can't honestly call myself a gun blogger, because while folks like Linoge and Weerd and Tam talk about them on a daily basis, I'm lucky to talk about them once a week. If anything, I am the gunblog community's bratty little sister: when I'm not too busy playing with my dolls or having imaginary tea parties, I sometimes tag along with them to the range to shoot my rifles. Be that as it may, I've written a fair amount about my experiences with owning, buying, shooting, accessorizing and maintaining guns. A few female friends have told me that I make gun concepts accessible and less scary to them in a way that other blogs and articles do not. I have also become a rather successful reviewer of firearms and accessories. 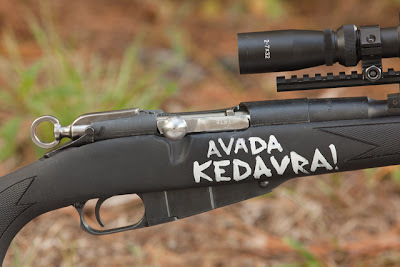 This is a resource page for those gunnies who want to look at what I've written about firearms without having to wade through all the other nerdy stuff I like to talk about, like role-playing games and science fiction and My Little Pony: Friendship is Magic. Every article with the "Guns" tag in descending chronological order (because that's just how blogger rolls). A thorough review of the Kel-Tec PMR-30 pistol by: Me; a handicapped lady named Gwen Patton; an instructor; my mother (also contains review of Smith & Wesson .380 Bodyguard).